Notebooks are coming into our life, both at home and at work. It's getting more difficult to choose a model for your requirements. Sometimes manufacturers try to help us and offer their classifications. But this is often done by marketing departments, which bring further confusion to beginners, who operate with "consumer" characteristics rather than CPU clock or wireless card type. The situation is complicated by the fact that hardware configurations of most mass-scale notebooks look alike. Truly exclusive models are extremely rare. CPU clock makes a difference only in those tasks, where it has to give all it has got. Efficient performance and power management systems reduce its frequency the rest of the time. They try to increase its battery life and reduce the load on its cooling system. But in fact, there are not so many significant tasks. Memory size is also not a limit to most applications. Especially as it can be easily upgraded to 1.5-2 GB in many models, it's quite sufficient now (and even tomorrow – for Microsoft Vista). Serious requirements to a video system are posed only by games and various specialized graphical applications. But it makes no sense to run any such application on a notebook (I repeat – we speak of mass-scale models) – modern games will evidently lack performance, and the screen resolution will be insufficient for professional applications. Theoretically, all these applications will work – games and CADs. But regular notebooks will not provide enjoyable gameplay or efficient work session. Capacities of modern mobile hard drives are sufficient for everything, even for medium-sized video libraries. Besides, you can easily use external storage devices with USB 2.0 and FireWire interfaces. But there is one more parameter - battery life. But it's hard to separate it from performance, and evaluations often have little to do with the real care for user's tasks. So it's rather difficult to take it into account. Thus we can see that the key parameters to be taken into account when you choose a notebook may have nothing to do with its technical elements. There is another group of requirements important for so-called corporate users. In particular, reliability, security, ease of use, and compatibility with existing equipment are more important here. While it's practically impossible to evaluate reliability for a couple of weeks correctly, the other characteristics are quite palpable. That's what manufacturers often focus on to design business series of notebooks. One of implementations of such requirements is Fujitsu Siemens Computers LIFEBOOK S. Today we are going to review one of these models. Interfaces 3x USB 2.0 i.LINK/IEEE 1394 (4-pin) PC Card and ExpressCard VGA and S-Video outputs RJ-11 modem port RJ-45 LAN port Headphones-out, mic-in Fast IrDA 1.1 (4 Mbps) Power adapter connector Docking connector for a port-replicator. Interfaces of the port replicator 4x USB 2.0 VGA and DVI-D (with HDCP support) Serial and parallel ports RJ-45 port PS/2 port Audio-in/out Power adapter connector. The Moscow office of Fujitsu Siemens Computers provided us with a pre-sale sample of the notebook. So we cannot publish exact information about the bundle and software. Besides, this configuration will not be available in retail. So before you buy this notebook, you'd better read specifications of your model attentively. The S7110 series includes several notebooks with different configurations – processor, memory size, HDD capacity, optical drive type. Besides, the models may come with 1024×768 or 1400×1050 panels and with/without a finger scanner. The notebook is built on the latest mobile platform from Intel. It uses Intel 945GM chipset and ICH7-M. With the release of mobile processors Intel Core 2 Duo, the S7110 line will include models based on these processors. DDR2-667 memory is installed into two SO-DIMM slots, which guarantees high performance of the memory system and allows to augment its size to 4 GB supported by the chipset, when corresponding modules appear. The integrated video adapter copes with all modern business applications, including video playback in HD formats (the powerful processor is of an assistance here). I'm somewhat confused by the 4:3 panel. But this property is not that relevant for this panel size – watching wide movies is not the main task for this model. Seagate ST9120821AS drive used in this notebook is manufactured for OEM only. This is not the fastest series from Seagate already, 5400 RPM. But it can still compete with modern models. Besides, hard drives are the most changeable components in notebook configurations. 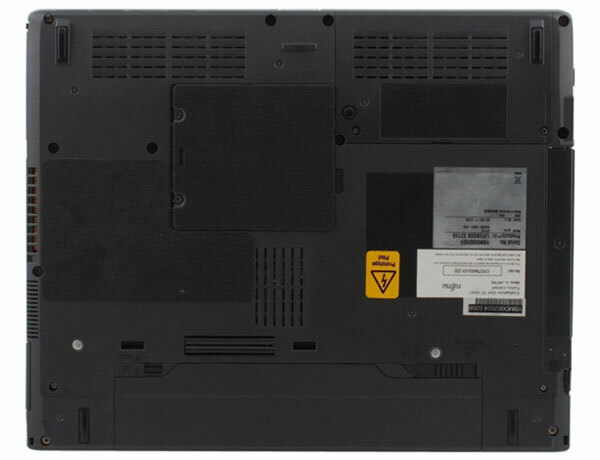 Notebook manufacturers even do not always mention exact models in specifications. The optical drive MATSHITA UJ-841Db copes with reading and writing all popular formats of optical discs, including double-layer discs. The maximum speed for DVD is 8x. It's 24x for usual compact discs. Communication features include a gigabit local area network based on Yukon 88E8055 (installed on the PCI-E bus), a wireless adapter Intel PRO/Wireless 3945ABG, Bluetooth 2.0 controller, an analog modem, and an IrDA port. Note that the Wi-Fi and Bluetooth adapters are optional. They are not used in all configurations. There may also appear a UMTS/GPRS adapter in the next modifications of the notebook. The audio system based on HDA chip Realtek ALC262 supports only stereo and provides basic features. Note that our sample did not contain a built-in microphone. But we've heard that it will be used in production-line samples. The model exterior corresponds to the business style – a strict dark case and a black mat lid with company's logo. Not to make the device too dark, its designers use silvery inner panels, which are partially visible on the outside. Besides, the fore part of the lid contains a small insert made of shiny plastic. The front panel houses a display lid latch, a wireless switch (in our case it affected both Bluetooth and Wi-Fi), and a small vent grid on the left. The left flank houses PC Card and ExpressCard slots, FireWire, headphones-out, mic-in, video output (you will need a special cable, included into the bundle), VGA output covered by a rubber lid, and a power connector. There is another vent grid in the middle of the left flank. The right flank contains only a Kensington lock, a modem input, a bay with an optical drive inside, a single USB 2.0 port. The rear panel houses an IrDA port, two USB 2.0 ports, a battery, another latch, and a LAN port. The bottom of the S7110 contains several vent holes, docking connector for port replicator, HDD and memory bays. The layout of connectors is rather convenient. The modem connector may be inconvenient – it's too close to a user, and a plugged cable hampers access to the optical drive and USB 2.0 port. But it's rarely used these days, so this is not very relevant. What's more serious, there are only three USB ports. And only one of them is easily available – on the right flank. The only excuse is four ports in the dock station, which can be used in the stationary mode. It also contains a full set of everything you can think of: VGA and DVI-D (supporting HDCP), serial and parallel ports, LAN port, PS/2, audio in/out, a power connector, and a lock (as our bundle lacked a port replicator, we publish information from the official FSC documentation). 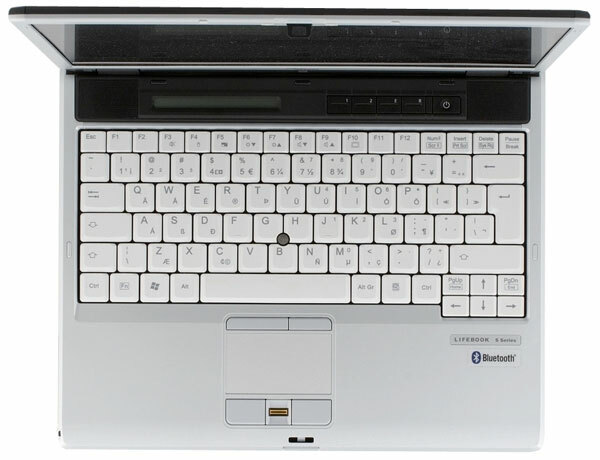 The notebook looks less strict with the open lid – silvery plastic, light-grey keyboard, black insert with speakers, indicators, and buttons. Even though the speakers are small, they are sufficient for a small room. You cannot get good low frequencies from them, of course. But they will do for business applications. The group of indicators is implemented as a monochrome LED. You can see it only when the lid is open. It's quite a controversial solution, because you can see the status of your notebook (a battery charge level or sleep mode) only when you open the lid and have a look at the screen. It's hard to tell why engineers did not use standard LEDs (for example, in addition to the display). The group of additional buttons consists of four keys, labeled "1", "2", "E" and "R". The last two buttons are used to switch to power saving mode and to run the backup utility. But you can use the bundled software to reassign all the four keys. 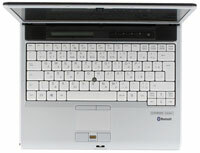 The keyboard is actually typical of 14" models (wide 13" notebooks are also equipped with keyboards of the same size). We can note the narrow left Shift, big BackSpace, and no Home and End buttons. We tested the "international" sample, so the keyboard in Russian models may differ a little. The main buttons are 18×18 mm, buttons in the upper row and cursor keys are 16×13 mm. There are two pointing devices – a touchpad and a pointstick. It's done to please everybody. There are also two sets of mouse buttons. A finger scanner is installed between the touchpad buttons. It can also be used for vertical scrolling. The notebook with its battery and an optical drive weighs 2.08 kg. The power adapter with a cable weighs 420 g.
As we tested a pre-sale sample, we cannot describe the bundle to the last component. Our box contained a notebook, a power adapter, S-Video cable and a set of optical discs with an operating system and Toshiba Bluetooth driver. These components will most likely be present in all bundles. According to the company representative, a port replicator will also come shipped with all models. Additional accessories to be bought separately include external storage devices (USB drives, a floppy drive, a card reader), power adapters (mains and car adapters, main and additional batteries, external chargers), a port replicator, various bags and folders, communication devices (ISDN cards, Bluetooth and Wi-Fi adapters, USB-LPT cable, web camera, etc), security devices (SmartCase cards in particular). Users are also offered memory modules, optical drives, and hard drives for upgrades. E, S, Ð¡ and Celsius series of FSC LIFEBOOK notebooks can use the same accessories: PSUs, port replicators, optical drives and other devices for a bay (all devices in a module bay support hot swapping). As our sample was a pre-production model, we didn't run a full series of tests and limited ourselves to subjective evaluation only. The panel in our sample produced a nice impression on us. Brightness and contrast are on a high level. But angles of view are not narrower than in other notebooks. However, it's not very important for a business model – presentations should be conducted with a projector or a TV-set. Using the 1400×1050 resolution in a 14.1" panel results in very small GUI elements. So if your eyesight is not very good, you'd better choose a model with the 1024×768 panel. Traditionally, we tested battery life with BAPCO MobileMark2005. We also published the performance score in parentheses for the Productivity test. We used the standard Portable/Laptop scheme adjusted for constant operation of the display and hard drive. Note that FSC does not have a proprietary power management program. But you should install special drivers, which modify the operational mode of the notebook. In particular, when installed, the notebook starts charging from the mains, only when the battery is discharged by more than a half. This feature even delayed our tests a little, because we had to fully discharge the notebook before charging it up. 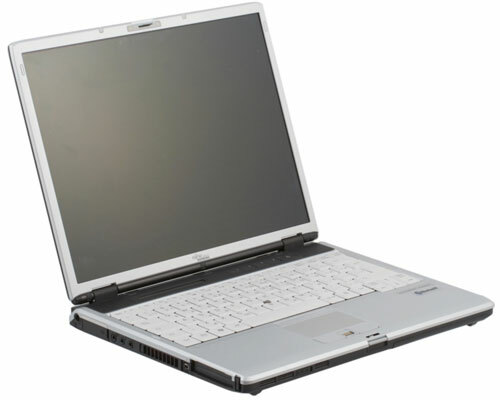 The S7110 model demonstrated the maximum performance level among all notebooks reviewed in 2006. 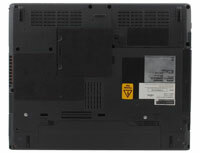 Its closest competitor is Acer TravelMate 4670, even though it's equipped with a slower processor – T2500. Competitors with T2600 (ASUS V6J and Toshiba Qosmio G30) are also close – they are outperformed by about 5%. The spread of battery life results was significant last year, the S7110 with its 3 hours and something was in the medium group. On the other hand, it outscores all models with T2500 and T2600 processors here, so it takes the first place among high-performance models in this test as well. Models that defeated this notebook in battery life (LG M1 Express Dual 5225R, Samsung P50, and Sony Vaio VGN-SZ1HRP) offer much lower performance. DVD playback time is slightly below three hours. The problem is most likely in the high resolution of its panel. The XGA modification will demonstrate a better result. The leaders of this test (for example, LG M1 Express Dual 5225R) demonstrate about four hours. The notebook from FSC is also in the middle of the table in battery life in Reader mode. The highest result in this test in 2006 was demonstrated by Samsung P50 – over five hours. We slightly modified the power supply scheme for the Wireless test – we used RMClock to control CPU clock, we didn't modify the HDD off mode, and we used Eco Power Saving Utility to disable unused devices (in particular, the optical drive, PC Card and some other ports.) As a result, we got three hours. There is actually nothing to compare the result to – 164 minutes were demonstrated only by Toshiba Qosmio G30. But if we consider the Reader mode, three hours are not bad at all. On the whole, LIFEBOOK S7110 demonstrated top performance and decent battery life. A secondary battery (don't forget that it can be used simultaneously with the main battery here, although at the cost of removing the optical drive) will most likely make this notebook an absolute leader in all tests. Our tests of the FSC LIFEBOOK S7110 demonstrated that even standard components can be used to create a really good business notebook. Even though the secret of designing a popular model seems too simple (state-of-the-art components without excesses, additional security functions, maximum communication features, low weight and long battery life, necessary accessories in the bundle), some manufacturers do not have such models. So if you look for a notebook for your work, which can cope with all functions of a desktop computer, be mobile and convenient to use, you are recommended to consider LIFEBOOK S7110. The notebook gets the Original Design award for a good combination of state-of-the-art technologies.